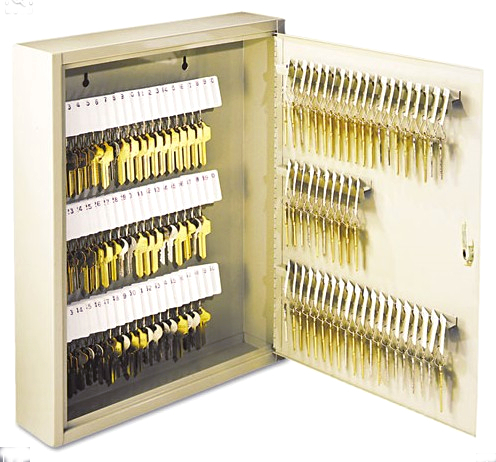 Key cabinet with 110 key capacity. Keys are attached to numbered key tags and filed on key rack slots for easy identification (key tags included). Slotted steel key racks hold key tags securely. When a key is loaned or issued, and "Out Key" control tag recording key number, key recipient, and date is filled out. "Out Key" tag is filed on same slot to provide key accountability. Alphabetical and numerical lock location data charts aid in organization. All cabinets are made of welded heavy-gauge steel with piano-hinged doors and key panels. Locking door includes standard disc-tumbler key lock with two keys. Available with single or dual locks on key cabinet door. Color: Sand. Key cabinet, locking 110 key capacity Uni-Tag key cabinet. Size: 14 inches W x 17-1/8 inches H x 3-1/8 inches D. Available with single or dual locks on key cabinet door. Color: Sand.